The long ordeal is over. I've finally hacked turkey burgers. "[Obama] should speak out that this is a corrupt, fraud, sham of an election. The Iranian people have been deprived of their rights. We support them in their struggle against a repressive, oppressive regime. And they should not be subjected to four more years of Ahmadinejad and the radical Muslim clerics." Whatever happened to conservatives who actually knew how to handle stuff? I find myself very nearly missing Richard Nixon. The guy didn't have an honest or ethical bone in his body, and I deplored his foreign policy, but at least he had the intellectual maturity to recognize that diplomacy requires sober weighing of strategies, and a disciplined approach to achieving the outcome best serving your interests. So what's with these current guys, and their undisciplined, pinheaded predisposition to simply let rip? What happened to all those competent, crewcut, Republican squares? "My son was martyred in the Iran-Iraq war. I don't want to lose our Islam. We did not participate in 1979, in the revolution, to have this kind of freedom that Mousavi supporters claim that they want." I've now lost thirty pounds since my peak (just after I got home from my cursed Chow Tour, which also left me with high blood pressure, blood sugar, and cholesterol). Health and weight loss have been my top priority ever since, and I'm finally able to fit into high school pants, but it's been a remarkably tough slog...even with an immaculate diet and Tasmanian Devil workouts. I've learned a lot, but here's the big takeaway: losing weight costs $1000/pound. Most people budget more like $10 or $20/pound. Like many people, I kept trying to back into dieting via a series of swearings off. Many years ago, I kissed my morning scrambled egg sandwiches goodbye. Then I swapped water for juice. Then abandoned dessert. And so on. And I started working out, which involved a series of swearings on (i.e. treadmill time expanded from fifteen to twenty to thirty minutes, more weight lifting exercises added, etc). The problem was that I couldn't swear off foods, or swear on exercise, fast enough to keep up with increasing age, which made weight loss harder and harder. Coming from a family with a penchant for rotundity, not gaining weight was, itself, an accomplishment. And so my spare twenty five pounds never came off. It was like being caught inside a metabolic ratchet wrench. Over the past two years, I decided to see what it truly took to reach my ideal weight. I'd always assumed it would simply involve a bit more swearing off. I'd eat out less, make lots of brown rice (mistake! high glycemic! ), be more consistent at the gym, and the weight would melt off, a couple pounds at a time. Nyuh-uh. Here's the grim truth: if I eat 1800 calories per day in three home cooked meals with no processed ingredients, saturated fats, sugar, white flour or fried stuff (just things like wild salmon, skinless chicken breast, broccoli, kasha, etc.) plus do four or five multi-hour grueling workouts per week, I can shed just under half a pound per week. If I lapse - miss a couple of workouts or dive expansively into some lasagna - I can easily pack on 1.5 pounds per week. Do the math: one serious slip-up per month means one half pound weight loss for that entire month! I'm not complaining. I love how I eat now. By balancing each meal's allocation of carbs/fats/proteins, and sticking to whole foods (lowercase), I come away from the table feeling great. And I like the workouts, to which I've grown addicted. But progress is glacially slow, and it's taken time to accept this. At my rate, if I lapse only bimonthly, it will take a full year to lose the twenty optional pounds remaining between me and six-pack abs. Each pound of lost weight requires a full two weeks of careful diligence (and time spent on cooking, food shopping, and gym visits). It's truly $1000 worth of effort. But now that I know this, it's actually easier to settle down and take a longer view. If you expect it to happen faster, easier, cheaper, you're as doomed to failure as a marathon runner who checks his watch during the race's first hour. My aim here isn't to send distraught overweight readers retreating to their Haagen-Dazs to lament the futility of it all. My point is this: you must budget appropriately. Speaking of lack of wily circumspection (see the posting one down from this one), Joe Biden, the Baron of Blurt, this week let loose that he still has his eye on the presidency, thus needlessly destabilizing the administration's power dynamic. And,a day later, they're already writing stories about Sarah Palin versus Joe Biden in 2016. If the notion seems preposterous, note that author Mark McKinnon is a political heavyweight. While I find Biden likable and agree with him on several policies, the last thing our country needs any time soon is a reversion to ill-measured impetuous leaders, likable or not. I'd vote for him over Palin, but pray it never comes to that. "She got thrown in the deep end before she could swim. As my friend Stuart Stevens said, “It was like picking someone of the street and telling them they had to take the M-CATs the next day.” But, she dog-paddled furiously, thrashed about, made a lot of waves, and managed not to drown. And now she’s got her water wings. And she’s working on her strokes. And by 2012 or 2016, she’ll be a lot stronger." Here's an awesome humane mousetrap you can make in about fifteen secs. On the other hand, read the comments for some interesting debate about what, exactly, constitutes "humane" in this context. I've been around for the death of several cherished American institutions, having patronized independent book, hardware and record stores as big box companies bullied them into the grave. But, counterintuitively, the more I tried to support such places, the more I started to question just how tragic it was that they'd soon be gone. Let's talk about books. Indie bookstores had limited stock, iffy organization, and high prices. And while some were owned by wonderfully colorful characters as labors of love, most were simply stores - just like Barnes & Noble, but without the low prices, huge selection, immaculate organization, or long operating hours. And there are colorful characters working in Barnes & Nobles; people for whom books are every bit as much a labor of love. Don't get me wrong. I found the systematic extermination - targeting mom and pops to expunge every iota of competition - disgusting. That's why I went out of my way to shop in indies. But rarely did I feel these places appreciated my business. Why had I traveled the distance, paid the premium, rushed in before closing, and risked disappointment? In retrospect, while I regret the rare gems that were lost, most deserved to vanish. Indies might have taken the offensive by mustering all the creativity, personal warmth and customer service they could. Instead, most grew more chain-like; inflexible and impersonal. Bending over backwards to offer my support, I rarely enjoyed more pleasant experiences than those offered by encroaching mega-chains. "....the place never caught on, though it wasn't for lack of effort by Maria, her intensely loyal cadre of fans, and New York's food writers, whose rave reviews plastered Bo's walls and windows. Sometimes when I'd drop by, Maria would tell me I was her first customer in days. It was heartbreaking, but, amazingly, she never slackened. On the contrary: As the situation grew more and more desperate (the waitress, unable to live on 15 percent of nothing, went back to Korea months ago, leaving Maria no choice but to wait and bus tables herself), she responded by determinedly making everything even better. Nearly every meal I'd eaten at Bo was superior to the preceding one. She was daring the world to eat elsewhere; creating food that might, via the sheer magnetic pull of its almost diabolical goodness, lure customers off the streets. Yet only a trickle of business was ever conjured up. That's the spirit! But Maria was a rare exception. Good restaurants which fail to catch on most often respond by declining into cranky attitude and lackluster cooking, alienating their remaining clientele. It makes no sense, but that's how it is! Now, sigh, check out this bush league editorial from last week's NY Observer. It's a deadringer for the sort of ham-fisted, hazy-minded, unedited rant one finds in the average blog. And that makes my head want to explode. If I was one of the lucky few with a job in the newspaper business at this point, I'd bleed marrow to make each and every word a gem; defying readers to dismiss the greater value of serious journalism. Of course, I'm not suggesting that one bad editorial - or one cranky bookstore manager - ought to damn an entire industry to extinction. But it's so very disappointing when desperate straits fail to inspire noble striving. 1. The next big thing in notebook computers will be inclusion of cellular modems, which will get online from just about anywhere (no more hunting for wifi!). 2. Laptops equipped with cell modems will require data plans with cellphone carriers (though, depending on bandwidth limitations and throughput when you're at home, you may be able to cancel your current ISP). That may sound like bad news, but this also means carriers are likely to subsidize some of the laptop's price, as they do with iPhones. 3. Two generations back, Apple eliminated the option for matte screens, and the glossy ones can be awfully glarey (plus any shmutz that gets on the screen is acutely distracting). There's been much outrcry, and they've just added back a matte option for the 17" Macbook Pro. So it's not unthinkable that matte will be offered once again in future generations of 15" Apple laptops. 4. If you can consider waiting to buy a computer, you certainly ought to. No electronic equipment should ever be bought until the need is acute, because something better/cheapers/faster is always right around the corner! 1. Dr. Rose, the CEO, mentioned at a conference (listen to audio) that ST-669, SIGA's broad-spectrum antiviral candidate, has shown "activity" against HIV. That is, of course, a long way from a cure (this drug is just at the beginning of its development cycle). But it's also shown activity against ten other major virus families (detailed news is thin, but word is they're aiming it at Lassa Fever, Rift Valley Fever, hepatitis, hantavirus, Ebola, leukemia, polio, and the common cold, in addition to HIV). 2. The Defense Threat Reduction Agency has announced their intention to fund further development of this drug. Meanwhile, SIGA's lead drug, ST-246, a smallpox/monkeypox cure, has applied for an enormous stockpiling contract with BARDA, which will be awarded in September. This is the only smallpox drug out there which fully fits the specifications of this contract - which, if awarded, would likely mean a stock price of $15-$20. Looking ahead, FDA approval is expected next spring, at which point ST-246 can be stockpiled by individuals and companies and will almost certainly procure foreign contracts (Israel, India, etc.). Also, the shelf life is fairly short, so the cycle will repeat. Plus, SIGA has a pretty far-along drugs for dengue and lassa fever, deemed potential pandemics. And another for drug-resistant staph and strep. And they have the backing of billionaire Ron Perelman, so while they surely will be bought by a big pharma company at some point, they certainly won't sell out early or cheaply. This story is being told as a cautionary tale for other idealistic entrepreneurs. And I've been remiss in failing to talk about venture capitalists. So we need to backtrack. ..."thank God (in a way), the bubble burst and there was no funding to be had and we'd gone from Cutting Edge to hopeless relic in the space of a few months." Why "thank God"? I can explain it quite easily by relating a story I'd heard early-on from an embittered former entrepreneur who'd founded a sensational online company that had garnered VC funding. The VCs had overreached for control, of course. And they weren't eager to see him paid a living wage, of course. Those sorts of issues are to be expected. But here's the really gripping part: When a healthy buyout offer had been extended, which would have made my friend a multimillionaire, the VCs nixed the deal. Why? Because VCs aren't looking for prudent gains. They're looking for an absolute explosion from a couple of their investments, and expect to blithely toss the rest into the gutter. And the number one rule of explosion seekers is: Never cash in your chips for less than a major score. You must let 'em ride all the way. Mind you, the VCs were fully aware by that point that this company was unlikely to ever explode. But they preferred to see the operation whither, preserving an infinitesimal chance of a breakout, rather than take a moderate profit. Whither it did, the VC's shrugged off the loss, and the founders escaped with little more than the shirts on their backs. The company itself was long gone by the time I heard this story. In that same Installment #2 quoted above, I recounted a meeting I'd had with the name partner of a highly-respected Silicon Valley law firm. The guy had gone on and on about how I needed to forecast a "hunredmillindollis home run". The guy was a feeder for that system. And it's not a system for people with mere $20 million dreams. Mega-greedy investors may be remorseless, but consider this: if you've concocted a home run business plan to attract VC investment (something we, finally, were unwilling to do), why shouldn't you be held to the stellar outcome you yourself had fabricated? After having forecasted a $100M future, pretending to be as ravenously greedy as the VCs you were courting, why would you accept less? It'd be chutzpah to say, "Well, of course that business plan was a bunch of bull; c'mon, guys, let's just grab this easy offer!" After waving bloody steaks at sharks, one ought not expect modest appetites. Of course, not taking investment money can mean a decade spent slogging along without resources, missing all sorts of opportunities (and even that only if things go really well!). But, hey, welcome to capitalism. Because we'd never taken venture capital, Chowhound, after nearly a decade, still existed (albeit as a choke collar around my neck)...and I was free to do little deals like this one with CNET. I'm a big fan of Stephen Colbert. But having him guest edit an issue of Newsweek strikes me as a really dumb, really desperate move. “Chito and Poncho are friends,” reads a sign at Finca Las Tilapias, Gilberto Sheedan's ranch near the Caribbean-slope town of Siquirres. Chito, as Sheedan is widely known, and Poncho, a one-eyed crocodile estimated to be 50 years old, are friends because they have spent a lot of time together during the past 17 years, since the day Chito rescued a near-lifeless Poncho from a nearby river. “Mae, cierre el ojo a la güila (‘Dude, wink at the girl'),” Chito cajoles, and Poncho dutifully obeys. Other commands Poncho follows include lifting his head and tail from the water, rolling over, and even allowing Chito to bite his fang. When Poncho is in a really good mood, Chito says, he'll venture putting his head all the way into the reptile's mouth, between his massive jaws. 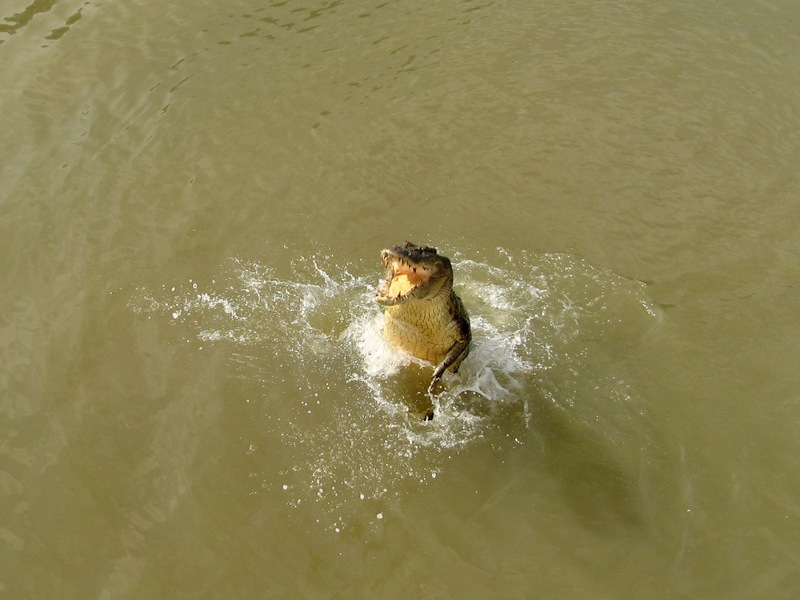 Chito was working as a sportfishing guide 17 years ago when he found a three-meter-long crocodile dying on the shore of the Parismina River, in the Caribbean province of Limón. The crocodile had been shot in the left eye, probably by a cattle farmer protecting his herd, Chito says. After enlisting the help of several friends to load the massive reptile into his boat, Chito brought the injured crocodile home to care for him, eventually naming him Poncho. He claims he healed the reptile with medicine, food, and, more importantly, lots of care and attention. During the recovery process, Chito stayed by Poncho's side, even sleeping with him at night. 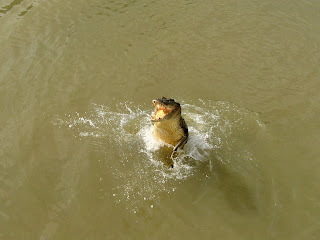 After Chito felt that Poncho had bonded with him, he started swimming with the crocodile. But it wasn't until seven years ago, when an employee saw Chito swimming with Poncho and told his wife, that “all the craziness began,” Chito explains. To help support crocodiles, make a tax deductible donation to Croc Encounters (here's their Facebook page, with great photos).